Great Sand Dunes National Park and Preserve in Colorado sits directly west of the Sangre de Cristo Range, which is featured in the background. The San Luis Valley is a region in south-central Colorado with a small portion overlapping into New Mexico. It is the headwaters of the Rio Grande. It contains 6 counties and portions of 3 others. The San Luis Valley was ceded to the United States by Mexico following the Mexican–American War. Hispanic settlers began moving north and settling in the valley after the United States made a treaty with the Utes and established a fort. Prior to the Mexican war the Spanish and Mexican governments had reserved the valley to the Utes, their allies. During the 19th century Anglo settlers settled in the valley and engaged in mining, ranching, and irrigated agriculture. Today the valley has a diverse Anglo and Hispanic population. It is an extensive high-altitude depositional basin of approximately 8,000 square miles (21,000 km2) with an average elevation of 7,664 feet (2,336 m) above sea level. The valley is a section of the Rio Grande Rift and is drained to the south by the Rio Grande, which rises in the San Juan Mountains to the west of the valley and flows south into New Mexico. The valley is approximately 122 miles (196 km) long and 74 miles (119 km) wide, extending from the Continental Divide on the northwest rim into New Mexico on the south. The San Luis Valley has a cold desert climate but has substantial water resources from the Rio Grande and groundwater. Prior to 1868 the Capote (Kapota) band of Ute Indians lived in the valley. The Utes made a treaty of peace with the United States in 1849 shortly after the Mexican War. Shortly thereafter settlers from New Mexico established several small settlements in what is now Colorado and in 1868 the Utes were removed to a reservation in western Colorado. They continued to play a role in Saguache in the northwestern corner of the valley from the Los Pinos Agency to the west of Saguache until they lost their expansive reservation as the result of the Meeker Massacre in 1879. The area was administered as part of the Spanish, later Mexican, province of Nuevo Mexico until the area was ceded to the United States in 1848 after the Mexican–American War in the Treaty of Guadalupe Hidalgo. Extensive settlement began in the Valley, primarily by Hispanic farmers and ranchers from New Mexico, in the 1850s after the construction of Fort Massachusetts by the U.S. Army for protection against the Utes, who previously barred settlers. Settlers built a church in the village that is now called San Luis and dedicated it on the Feast of Saint Louis, June 21, 1851. The history of the post-war U.S. military presence in the Valley is preserved at Fort Garland and other sites in the Valley, which became part of the Territory of Colorado in 1861. The lands in the valley were surveyed by the United States using the New Mexico Meridian and Baseline, unlike the rest of Colorado. The valley was one of eight candidate sites to detonate the first atomic bomb when White Sands Proving Ground was selected for the Trinity (nuclear test). Today, the Valley has the largest native Hispanic population in Colorado; many families are directly descended from the original New Mexican settlers. The original Ute population was confined to the Southern Ute and Ute Mountain Indian reservations in the late 19th century. The valley was the area that the outlaw Felipe Espinosa operated in. The San Luis Valley is the broad, generally flat, valley at the headwaters of the Rio Grande in south central Colorado and far north central New Mexico. The northern portion of the San Luis Valley is an endorheic basin; surface water does not exit this area. Irrigated agriculture is possible in the area due to groundwater and streams fed by the average 100 inches of snow the surrounding mountain ranges receive. The southern portion is drained by the Rio Grande. There is no clear southern boundary but the term is generally used to include the San Luis Hills of southern Colorado and the Taos Plateau of northern New Mexico. About 50 miles from east to west and about 150 miles from north to south, the valley is bounded on the east by the Sangre de Cristo Mountains and on the west by the San Juan Mountains. Within Colorado the San Luis Valley is generally considered to comprise six Colorado counties: Saguache, Alamosa, Rio Grande, Conejos, Costilla and Mineral. The principal towns are: Alamosa, Monte Vista, Del Norte, South Fork, Creede, Saguache, Center, Fort Garland, San Luis, Antonito, La Jara, Capulin, Manassa, Sanford, Crestone, Villa Grove, Hooper, Mosca, San Acacio and a number of smaller locations. A few other counties of Colorado have some land in the Rio Grande Basin including Archuleta County, Hinsdale County and San Juan County. Typical greasewood "chico brush" in the San Luis Closed Basin of the northern San Luis Valley in Colorado. Taken just south of the bridge over La Garita Creek on Highway 17 between Hooper and Moffat, Colorado. View is to the southeast. The Great Sand Dunes are in the background as are the Sangre De Cristo Range. Medano and Mosca Passes are the low points, the Sierra Blanca is to the right. Blanca Peak is prominent in the Sierra Blanca at the southern end of the northernmost section of the mountains, which is known as the Sangre de Cristo Range. There are several passes, with elevations between 9,000 and 10,000 feet (2,700 and 3,000 m), giving access to the valley. North La Veta Pass, through the Sangre de Cristo Mountains, is used by U.S. Highway 160 and by the San Luis and Rio Grande Railroad (formerly a branch of the Denver & Rio Grande Western) tracks. Other passes used historically were Medano, Mosca and Sangre de Cristo Passes. 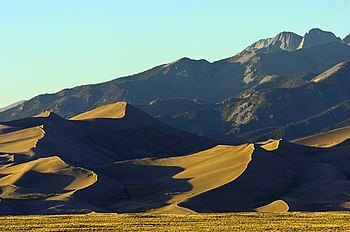 The Great Sand Dunes are a famous feature of the valley. They lie directly to the west of the Sangre de Cristo Mountains. The dunes can reach 750 feet (230 m) high. The Great Sand Dunes National Park and Preserve is now in place to protect both the dunes and the numerous archeological sites found in the area. The natural valley aquifer is close to the surface in this part of the valley, and helps with maintenance of water levels in the San Luis Lakes, just to the west of the sand dunes. Elevation rises as you go north in the valley to Poncha Pass, used now by U.S. Highway 285 and historically by the narrow gauge tracks of the Denver and Rio Grande Railroad. Otto Mears, then of Saguache, built and operated an historic toll road over Poncha Pass at the north end of the valley into the San Luis Valley during Colorado's 19th century mining era when the valley was the gateway to the San Juan and Gunnison country and the Ute agency was in the mountains west of Saguache. Cumbres Pass is a 10,015 ft. pass between Antonito, Colorado and Chama, New Mexico. The pass is traversed by State Highway 17 and the Cumbres and Toltec Scenic Railroad (originally built as the San Juan Extension of the Denver and Rio Grande Railroad that ran to Durango, Colorado). From the headwaters of the Rio Grande Wolf Creek Pass is the route of U.S. Highway 160 between Del Norte, Colorado and Pagosa Springs, Colorado, while Slumgullion Pass is the route of State Highway 149 between U.S. Highway 160 and Lake City, Colorado. Stony Pass, sometimes spelled Stoney Pass, an historic wagon road to the mining camps of the San Juans, is now a jeep trail. At the north end of the valley, North Pass is the route of State Highway 114 between Saguache, Colorado and Gunnison, Colorado, bypassing the original route over Cochetopa Pass, now a county road. The Rio Grande follows a course through the southern valley from Del Norte southeastward via Alamosa to New Mexico. South of Alamosa it is joined by several streams from the west including the Alamosa River and the Conejos River and Culebra Creek from the east. Most of the northern valley is an endorheic basin called the San Luis Closed Basin. Generally, within the Closed Basin the major streams such as Saguache Creek, San Luis Creek, and the streams from the west face of the Sangre de Cristos flow only a short distance onto the valley floor as surface streams. Only in very wet years, perhaps every 20 years, does the stream system in the Closed Basin flow as a connected unit into San Luis Lake at the low point of the Closed Basin west of the Great Sand Dunes. Large areas of private lands have either been subdivided into subdivisions of small "ranch" lots or have been sold or donated to the Federal government and make up portions of the Great Sand Dunes National Park and Preserve, other wildlife preserves, and various state wildlife sites. A generalized cross section of the San Luis basin from east to west. The San Luis Valley contains an alluvial basin, the Alamosa Basin, which lies at the north end of the Rio Grande rift. Deeper alluvial strata, overlying Precambrian basement rock, Eocene alluvial deposits from a shallow Laramide depression, the Blanco Basin Formation; and Oligocene ash and lava flows associated with the Conejos Formation, is the Santa Fe formation, mixed alluvium and lava outflows from the San Juan volcanic field to the west; later strata comprise the Alamosa formation, alternating layers of sand, gravel, and clay. 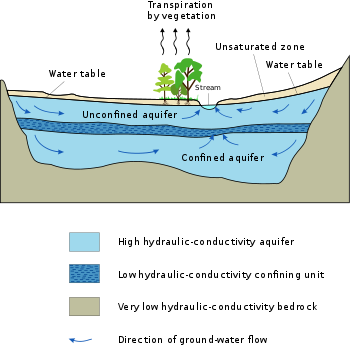 The relatively impermeable clay layers trap ground water in the "confined aquifer" which, if tapped, supplies artesian wells. 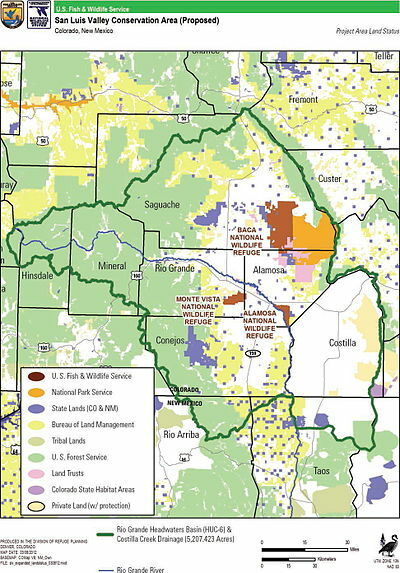 Surface waters, including the Rio Grande and other streams, are hydrologically connected to the "unconfined aquifer" a shallow ground water formation which underlies much of the valley. The deeper confined aquifers have sufficient hydrological connection with the surface waters of the valley that they are not considered for the purposes of Colorado water law "nontributary" waters which could legally be mined. Streams which flow into the valley, particularly the Rio Grande, have deposited alluvial fans where they emerge from higher terrain onto the valley floor. The gap between the Precambrian basement rock and the Eocene alluvial deposits in the San Luis Valley is considered evidence that much of southern Colorado, including the western portion of the San Luis Valley, was highlands in the period prior to the Eocene Epoch, 56 to 34 million years ago. There were lowlands to the north in central Colorado, the Colorado sag, an east-west basin. It is from those highlands to the west, in Paleozoic, Pennsylvanian, and Permian times that the coarse alluvial deposits of the Sangre de Cristo Formation such as the Crestone Conglomerate originated. The Minturn Formation, a limestone formation exemplified at Marble Mountain on the crest of the Sangre de Cristos, is evidence of a sea in the Central Colorado Trough during the era of the Ancestral Rockies. In the middle and late Cretaceous Period, about 100 million years ago, the San Luis Valley lay on the shore of or beneath the Western Interior Seaway, a shallow sea which divided North America into two parts. As the sea deepened and expanded sand and gravel eroded from mountains in the west was deposited in the Dakota Formation; later, when the sea was deeper mud and sand were deposited in the Mancos Shale. The Lexam oil play near Crestone is based on the hypothesis that there is oil trapped in Dakota Formation sandstones lying beneath Mancos Shale to the west of the Sangre de Cristo fault at the western base of the Sangre de Cristo Range southwest of Crestone. Drilling at the base of the range during gold exploration in the vicinity showed small amounts of oil and evidence of the existence of those formations as well as the underlying Morrison Formation. Prior to this discovery it was assumed that these formations had eroded away during the Laramide orogeny. Building of the Rocky Mountains by folding during the Laramide orogeny 80 to 55 million years ago created a highland, the San Luis-Brazos uplift, in the area of the San Luis Valley. This process over 30 million years resulted in an elevated and highly eroded peneplain where the San Luis Valley is today. There was a basin in its western portion which may have drained west through the course historically followed by the San Juan River. Sedimentary deposits formed in that basin during Eocene times remain in place beneath the western portion of the San Luis Valley. "2007 Rocky Mountain Section Friends of the Pleistocene Field Trip—Quaternary Geology of the San Luis Basin of Colorado and New Mexico, September 7–9, 2007"
Much of the land in the San Luis Valley is used for grazing. Farming is generally concentrated in Conejos County and around the towns of Alamosa, Monte Vista and Center. Principal crops include potatoes, head lettuce, wheat, and barley. The barley grown here is the main supplier for Coors beer company. In 1982, quinoa was successfully grown for the first time outside of South America in the San Luis Valley of Colorado, and commercial growth has occurred since 1987. Less favored areas with a shorter growing season and less access to water rights tend to be devoted to alfalfa and grazing. Broad areas, especially in Saguache County, Colorado have a high water table or are even flooded part of the year. Uncultivated land is often covered with "chico", low brush such as rabbitbrush, greasewood and other woody species. Cropland is typically irrigated with large (1/4-mile radius) center-pivot irrigation systems, and a common feature of the Rio Grande Delta area where the Rio Grande enters the valley are large piles of potato-sized rocks screened from the soil. There are over 500 known artists living in the San Luis Valley as evidenced by an ongoing directory maintained by Monte Vista artists' group, The Art Thing, The Art Thing's membership boasts several nationally recognized artists working in various media. Monte Vista is also home to the  Monte Arts Council as well as several festivals and an art tour that attracts artists from as far away as California and North Carolina. The San Luis Valley is home to five active live theaters, two at Adams State University, The Creede Repertory Theater, The Old Spanish Trails Theatre Company and Rocky Mountain Stage in Monte Vista. In August there are several major Music Festivals, the Crestone Music Festival and Spanish Trails Music Festival and Mexican Rodeo, as well as Rhythms on the Rio. Music in the valley has two well known sponsors in the South Fork Music Association and the Alamosa Live Music Association. A significant portion of the residents of the San Luis Valley are Hispanic with historic populations in Costilla and Conejos counties which were settled by early migrants from New Mexico. There are small Amish communities which were recently established. Predominantly agricultural in nature, the area is also one of the poorest rural areas of Colorado. Tourism has become a more important part of the economy in recent years, coupled with attempts to establish the area as a retirement community. Adams State University, a four-year state college at Alamosa, with approximately 2,500 resident students, is the major educational institution in the Valley. It is supplemented by a campus of Trinidad State Junior College in Alamosa. San Luis Valley Regional Medical Center, a full service Acute-Care hospital and specialty physician clinic is the largest employer in the Valley with over 600 employees. The arts are becoming an increasing force in developing the economy of the San Luis Valley. Tourist attractions suggested by National Geographic Traveler include the Monte Vista Crane Festival in March, Los Caminos Antiguos, a regional road network, the Luther Bean Museum at Adams State University, the Sand Dunes Swimming Pool Hot Spring, and the Firedworks Gallery on Main Street in Alamosa for regional history and art, and regional Mexican food. Also recommended near Alamosa for wildlife viewing are The Alamosa Ranch north of town and the Alamosa National Wildlife Refuge to the southeast. To the northeast of Alamosa lie San Luis State Park and the San Luis Lakes and the Great Sand Dunes National Park (turn east at Mosca, Colorado from State Highway 17 onto State Highway 150 then, after you view or visit the Great Sand Dunes, south to Ft. Garland.) Near the Great Sand Dunes, where only camping is available, the Great Sand Dunes Lodge and the Nature Conservancy's Zapata Ranch are recommended for lodging. At Fort Garland, Colorado south of the Great Sand Dunes on U.S. Highway 160 the Fort Garland Museum is recommended and further south on State Highway 159 at San Luis, Colorado, the oldest town in Colorado, the bronze sculptures by Huberto Maestas, depicting the Stations of the Cross. From San Luis, the National Geographic road trip suggests traveling west on State Highway 142 through Manassa, Colorado, then south on U.S. Highway 285 past Conejos, Colorado then west on State Highway 17 over Cumbres Pass to Chama, New Mexico paralleling the route of the narrow gauge Cumbres & Toltec Scenic Railroad. Rock climbing and camping are available at Penitente Canyon and other locations. A locally conducted survey of public health statistics showed a considerable deficiency with respect to most measures of public health. There is a deficiency of medical providers, for example, 106 physicians per 100,000 compared to the Colorado average of 278. 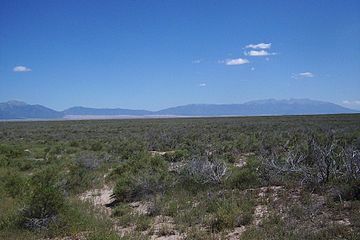 The San Luis Valley is an alpine desert environment which is conducive to solar energy production. It has the highest per capita concentration of home-based solar energy systems in the United States. Colorado law requires that 30% of the power used in the state be generated from renewable sources by 2020. It also requires that 3% of the power generated be used at or near where it is generated; i.e. distributed generation. There are also a number of utility-scale photovoltaic power stations in the valley, and an active market in selling or leasing land to be used for solar facilities. In 2007, SunEdison constructed the 7.7 megawatt Alamosa Photovoltaic Power Plant on about 80 acres near the town of Mosca, Colorado. It was the largest grid-connected solar electric facility in the United States at that time. It was followed in 2010 by the 19 megawatt Greater Sandhill Solar Plant, in 2011 by the 30 megawatt San Luis Valley Solar Ranch, in 2012 by the 30 megawatt Alamosa Solar Generating Project, and in 2015 by the 50 megawatt Hooper Solar PV Power Plant. All are located on previously developed agricultural lands near Mosca. On December 11, 2009, more than 125 people gathered to respond to a proposal by Tessera Solar (affiliated with Stirling Energy Systems) to install 8,000 40-foot parabolic mirrors on 1,500 acres (6.1 km2) near Saguache, Colorado. At issue was the noise expected to be generated by the numerous stirling engine generators, and the wisdom of industrial solar facilities in general. The application for a permit was withdrawn on July 11, 2011. There has also been controversy regarding proposed transmission lines over both Poncha and La Veta passes, which would open the door to much more industrial solar development. Opposition to a proposed transmission line has resulted in possible delays in development of solar facilities by Xcel Energy which together with Tri-State Generation and Transmission Association serves the valley. In 2012, the United States Department of Interior designated several Solar Energy Zones on BLM lands in the valley, although no projects have yet been announced to be in development. ^ What is a Ute? ^ Brister, B.; Gries, R. (1994). Tertiary stratigraphy and development of the Alamosa basin (northern San Luis basin), Rio Grande Rift, south-central Colorado. Geological Society of America Special Paper 291. pp. 39–58. ISBN 0-8137-2291-8. ^ Upson, J.E. (1971). James, J.L. (ed.). "PHYSIOGRAPHIC SUBDIVISIONS OF THE SAN LUIS VALLEY, SOUTHERN COLORADO" (Reprint). Guidebook of the San Luis Basin, Colorado. New Mexico Geological Society. pp. 113 to 122. Retrieved September 10, 2011. The New Mexico Geological Society is grateful to the Journal of Geology for permission to re- print this classic article. After 32 years the work still remains the most quoted reference in its field on the basin. ^ J. E. Upson (October–November 1939). "Physiographic Subdivisions of the San Luis Valley, Southern Colorado". The Journal of Geology. The University of Chicago Press. 47 (7): 721–736. doi:10.1086/624829. JSTOR 30056469. ^ a b c Brister, B.S. & Gries, R.R. (1994). "Tertiary stratigraphy and tectonic development of the Alamosa basin (northern San Luis Basin), Rio Grande rift, south-central Colorado" (PDF). Basins of the Rio Grande Rift: Structure, Stratigraphy, and Tectonic Setting. Geological Society of America Special Paper 291. pp. 39–58. Retrieved September 11, 2011. ^ Colorado Supreme Court (May 9, 1994). "American Water Development Inc. v. City of Alamosa" (Court decision). Retrieved December 1, 2017. ^ Siebenthal, C.E. (May 13, 1910). "The San Luis Valley, Colorado". Science. New Series. American Association for the Advancement of Science. 31 (802): 744–746. doi:10.1126/science.31.802.744-b. ISSN 0036-8075. JSTOR 1634777. ^ Wayne I. Anderson. "The Caves of Marble Mountain". Retrieved September 17, 2011. ^ Wayne I. Anderson. "ONCE UPON A GEOLOGIC ERA: PONDERING THE DEEP PAST OF CUSTER COUNTY". Retrieved September 17, 2011. ^ Thomas A. Watkins. "GEOLOGY OF THE NORTHEASTERN SAN LUIS BASIN, SAGUACHE COUNTY, COLORADO" (PDF). Colorado Geological Survey. Retrieved September 13, 2011. ^ Michael and Laura Murphy. "Road Trip: San Luis Valley, Colorado From National Geographic's Drives of a Lifetime Series". National Geographic. Retrieved September 22, 2012. ^ "Solar Energy Zones Identified in the Solar Energy Development Programmatic Environmental Impact Statement". Argonne National Laboratory. Retrieved March 11, 2019. Wikimedia Commons has media related to San Luis Valley.